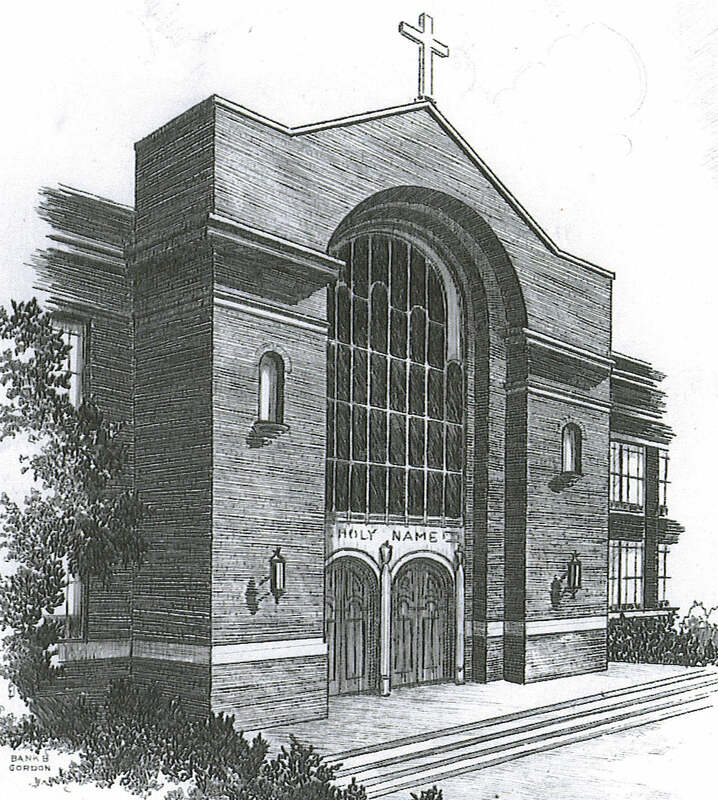 We moved from 2531 Himebaugh to 4314 Lake St. in order to be in Holy Name Perish so I could attend Holy Name High School on 45th & Maple. Actually it was on the corner of Maple and Fontenelle Blvd. It was a pretty good school in its day, but I never felt a real part of it. My years there were not real happy years for me. I missed my home on Himebaugh and all my friends. During my freshman and sophomore years I’d get out of school on Friday afternoons and hitchike to 30th and Ames to meet up with all my friends at the “Coffee House” for cokes & juke box and then go to the movie at the Beacon theatre. I’d never get home until after midnight, but the folks didn’t seem to mind. I’d stay home most nights during the week. 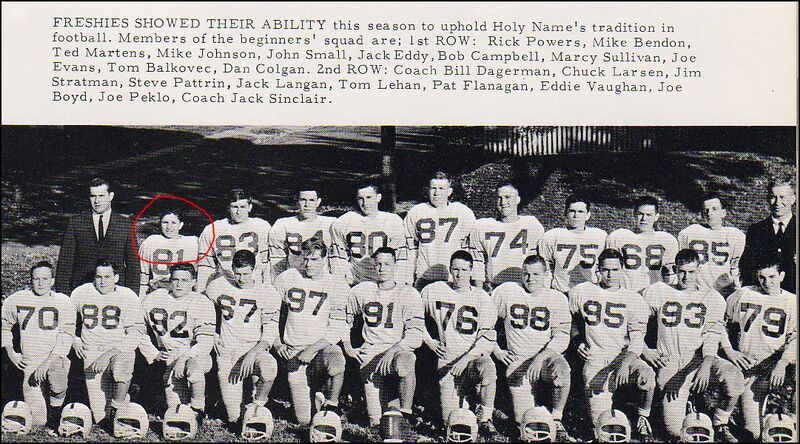 When I look at my freshman class picture, it’s little wonder that I wasn’t accepted into the preppie class at Holy Name in 1965. I was not one of them! My freshman year was the worst. I failed most subjects. 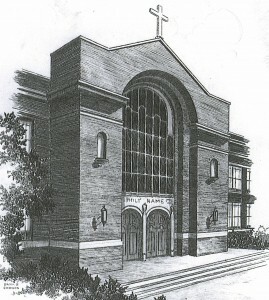 Sister Mary Ellen failed me very early in the year in Latin and I had to sit at the back of the class for the entire year and I remember clearly sitting in the back by the window and gazing out onto the parking lot longing for the time to pass. I’d especially get anxious on Friday nights because I wanted so desperately to get out of there and get back North to where I felt I really belonged. I think I failed three subjects and got 3 “D’s” in my other courses my freshman year. 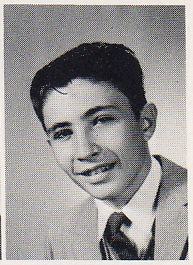 I had to go to summer school at Tech High to make up for it the summer of 1962. But that didn’t work because I got caught stealing the final exam for one of the classes and they kicked me and a friend out and we both lost credit for both of the courses we were taking that summer. How stupid is that? I really wanted to play football again my freshman year and I did get on the team. But I either served as a tackling dummy for the bigger kids, or I sat on the bench. I never got to run plays in practices, so when the coach decided to let me play one play at the end of the season at the end of a game I didn’t have any idea what I had to do. He had to put me in on offense also, instead of defense. That deeply disappointed me. I didn’t know the plays at all and I didn’t know what to do. So I just blocked and it was wrong. The quarterback chewed me out and they took me out of the game immediately. I was the smallest kid on the team and since I didn’t grow much between my freshman and sophomore year, I just gave up on football. Darn, I really liked football too. My Sophomore year wasn’t much better. I remember very little about it. 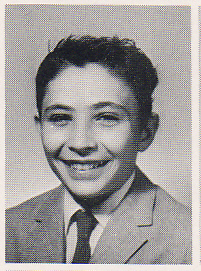 I remember that I had a couple friends at Holy Name that year, but they were never really serious friends. George Hayes tried to be real nice to me and took me out with the guys a couple of times. I remember driving through memorial park in a convertible and we were all messing around, jumping in and out of the car. I jumped out and caught my pant leg on the bumper and got a huge cement burn on my left knee. It scabbed and stained my sheets with drainage for weeks. I still carry the scar from that experience. I also entered the Golden gloves in January of 1963, the second semester of my sophomore year, but other than the serious sparring at times, I never had a real bout. I won the Omaha Novic e division championship, unapposed. I guess there was no one in Omaha at that time that had reached the age of 16 and still weighed less than 112 pounds. I was a real scary kid at 16, don’t you think? 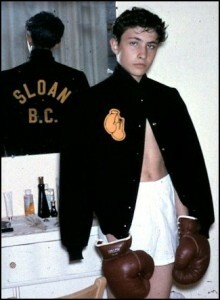 It was during those years that I sparred regularly with Myron Coleman. He was a tough kid but I could hold my own when I was at my peak, but he always seemed to come out the winner. He turned pro and had hundreds of professional boxing matches. He and his wife visited my church just before he died in 2004 or 5. I’ll have to look that up. 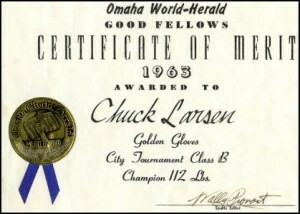 That year Myron had one bout at the golden gloves and came away runner up. I didn’t have any bouts and came away the city champion for my class and division. I had an equally impressive sophomore year grade report. I failed most subjects but somehow managed to come away with some kind of credit for them. I ended up with D- in all the subjects. I’m convinced that my great aunt, Sister Mary Perpetua, stepped in to help me out. But I can’t be certain of that. I never cared about school after Blessed Sacrament and could not get motivated no matter how hard I tried. 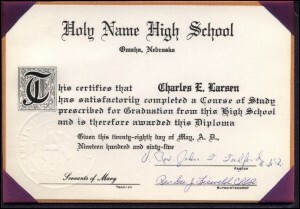 Neither Mom or Dad graduated from high school and neither felt competent to give me what I needed to get through the academics at Holy Name. I’m surprised that I accidentily absorbed some things during those days that have served me well. I’m not sure what, but there had to be something. My Junior year is pretty much of a blur also. I don’t remember starting it and dont’ remember finishing it, yet there were some things that happened during that year that I remember. I didn’t join the Golden Gloves this year like I thought I would, I don’t know why. But I had a great fight with my gym teacher, Mr Campbell and got thrown out during the early part of the 2nd Semester. I had to go to Benson High School to finish my Junior year. It was there that the English teacher turned me on to My Antonia by the Nebraska author Willa Cather. I read a lot. I have to say I wasn’t smart, but I could read and I read about anything and everything. By the end of my Junior year I had read all of John Steinbeck, including east of eden and the grapes of wrath. I enjoyed Canery Row and the red pony the best. I remember reading his travels with charlie and that’s when I gave up on John Steinbeck. I read the catcher in the rye during that time as well and felt a real connection with Holden Caulfield. I’m not sure why! J. D. Salinger really captured my imagination. Another thing that was truly prominent in my Junior year of High school was that I joined the Navy. Butch Larrew talked me into it, but I had intended to do it all along actually, I just needed a little push. 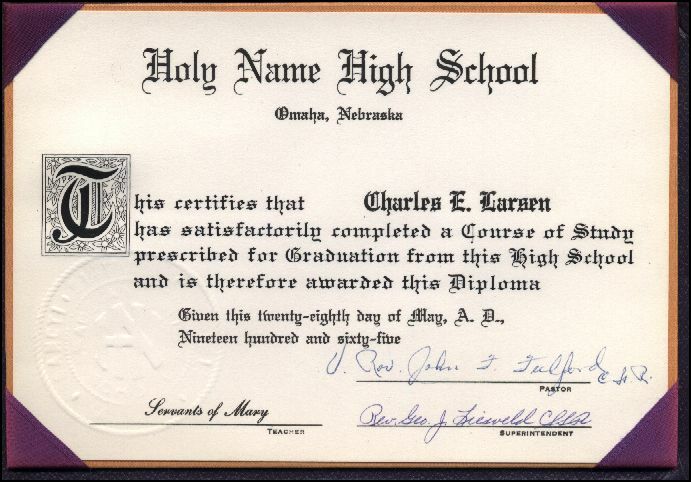 I had the physical and everything while I was still 16 years old and on February 12, 1964, less than a month after my 17th birthday, a Navy officer came to my house and witnessed my dad’s signature giving me his permission to join the Navy. I think he was greatly relieved that I would not be a burden to him the rest of his life. 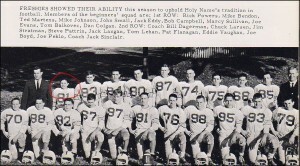 I even went to boot camp in June 1964 between my Junior and senior year. 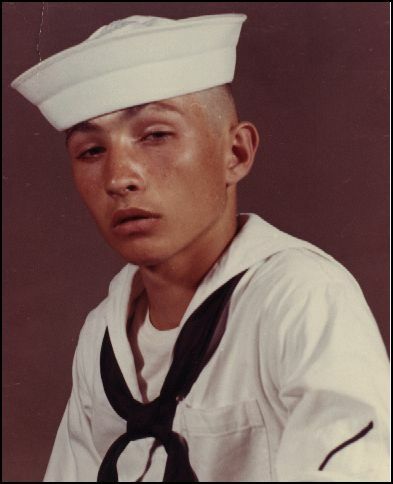 I was a real awesome looking seaman recruit, dont’ you think? I came home from bootcamp and went to work at Builder’s Products on 40th and lake and actually made some pretty good money for a high school kid. I got the job because the owner knew Dad was one of his best customers. I worked the rest of the summer and saved some money and when Gramma Shively came for a visit she took me shopping and helped me buy my first personal record player. It was a stereo! It had speakers on each side. She bought me three Martin Robbins albums as well and I listened to that music all the time. Acedemically my Junior year was like all the rest. I barely got through everything. I still didn’t care. I got my drivers license somewhere in my late Junior year or the summer before my senior year. I failed the drivers test a couple times. Not because I didn’t know the stuff. I only missed one on the written test, but I had a terrible time managing my dad’s 1958 chevy with the stick transmission. It was a bull! I finally had to borrow a friends Ford Falcon with an automatic transmission before I could get my license. Dad let me use the Chevy and I ended up crunching up the fender pretty bad. We never did get that fender fixed. In my senior year, I began to fit in. My hair was shorter because it didn’t have time to grow out after bootcamp. I actually landed the lead role in the Senior class play. It was a great experience. It was Marlene Pfingston, the teacher for the dummies of which I was the leading one, and she inspired me. I’ve always appreciated her giving me the chance. 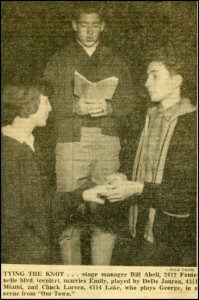 As the lead role of “George” in Thornton Wilder’s Our Town (doesn’t every HS do that play?) I think that the co-star, Emily was embarassed to be with me in that picture pretending to be married. Notice her looking down with disgust? 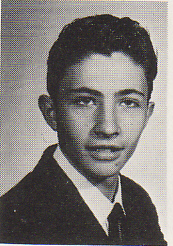 I wasn’t a very desirable kind of guy in High school. I was just a trouble maker and the good girls didn’t want to be around me, so that was interesting. Well, anyway, I entered the Golden gloves again and had my first real bout as a smoker before the tournament and won it. I’m undefeated. But then I quit and never returned. The guy I beat was a weight class above me and he won the lightweight title that year. I should have followed through! Darn! Since everyone knew that I was going into the Navy in the summer per my enlistment the year before, no one bothered with me too much. I did my own thing and just refused to study and actually was kind of hoping I’d fail out so the navy wouldn’t take me and I could just do whatever for the rest of my life. But Sister Mary Perpetua made sure that I got a diploma and the Navy took me. Oh well. I know the folks were relieved. I can remember many comments that my dad would make regarding me and the Navy. I’m convinced he felt that the military was the best if not the only place for me because I’d never make it in the world on my own. You know, he was probably right at the time. 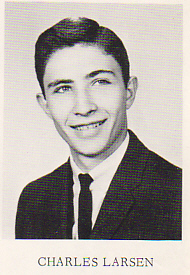 But I left for active duty on July 2nd, 1965 just a little over a month after I graduated from High School.